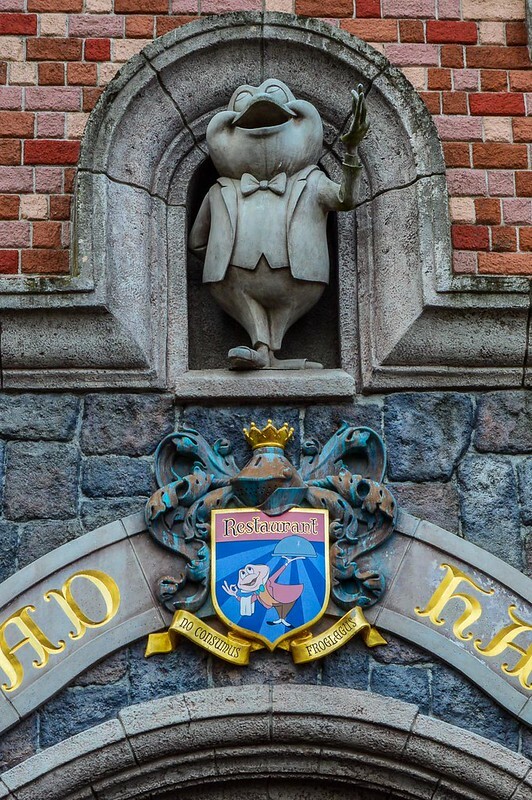 One of the all time greatest Disney characters (in addition to being the most fabulous character in English literature) isn’t a mouse, or a duck, or a blonde haired princess who easily lets things go – it’s a toad. One J. Thaddeus Toad, Esq. to be precise. 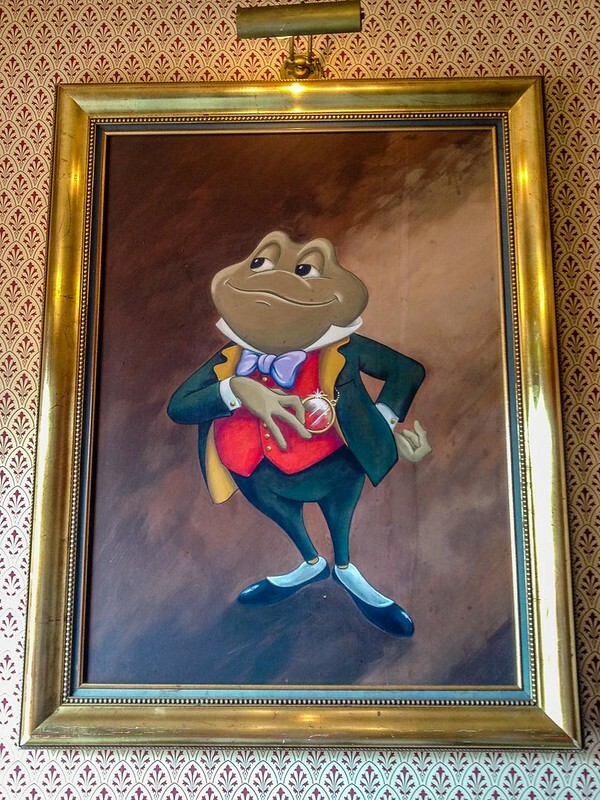 You may know him from his wild ride in Disneyland or from fond memories of his time in Disney World pre-Pooh, but if you really want to get to know Mr. Toad on intimate terms (as well as eat some so very british cuisine) a visit to his house in Disneyland Paris is in order. 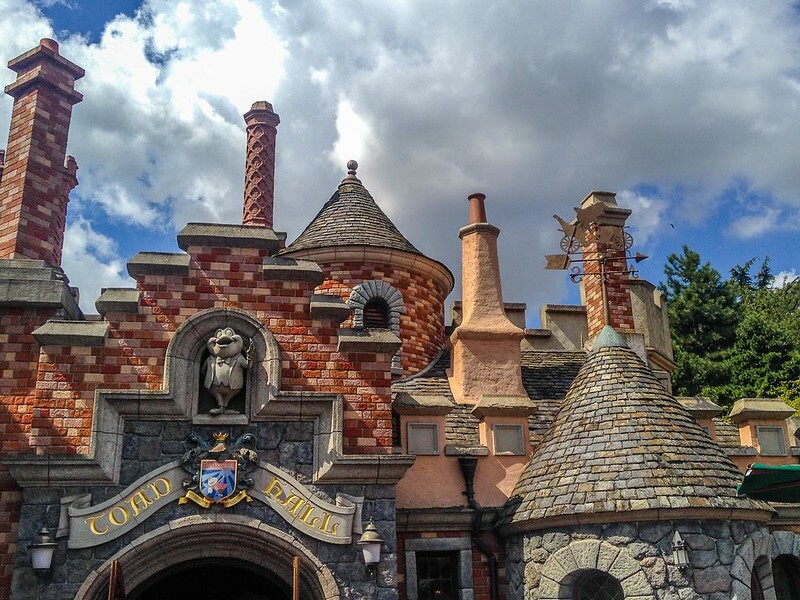 Strolling through the grounds of Parc Disneyland one day, finding ourselves merrily on our way to nowhere in particular, we suddenly stopped short, awestruck, for Toad Hall restaurant was open for business. This might not sound all that surprising, but for anyone who visits Disneyland Paris on a regular basis knows the befuddling irregularity with which their restaurants operate. All too common have we had happy hopes of eating somewhere specific, only to find it sadly closed. 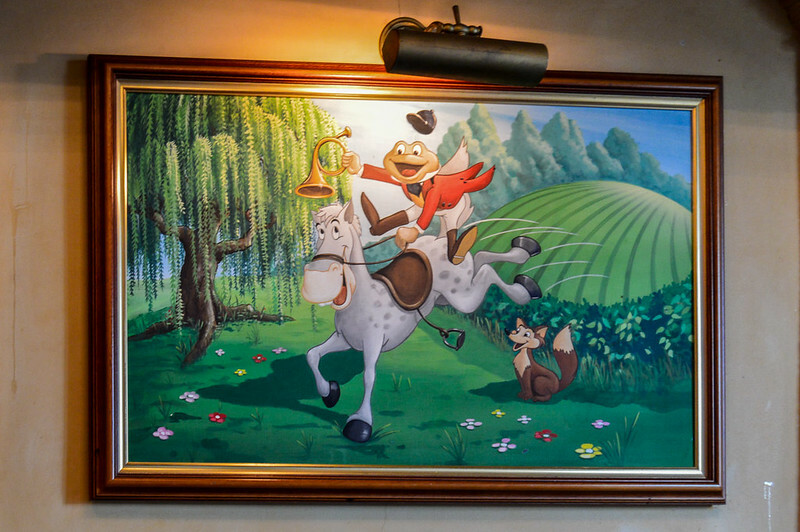 Restaurants at Disneyland Paris operate on a confusing schedule and perhaps most confusing of them all is Toad Hall. So, when we saw that it was open and people were coming and going with satisfied looks on their faces we could only wonder, what had we been missing? Well, only everything it turns out. 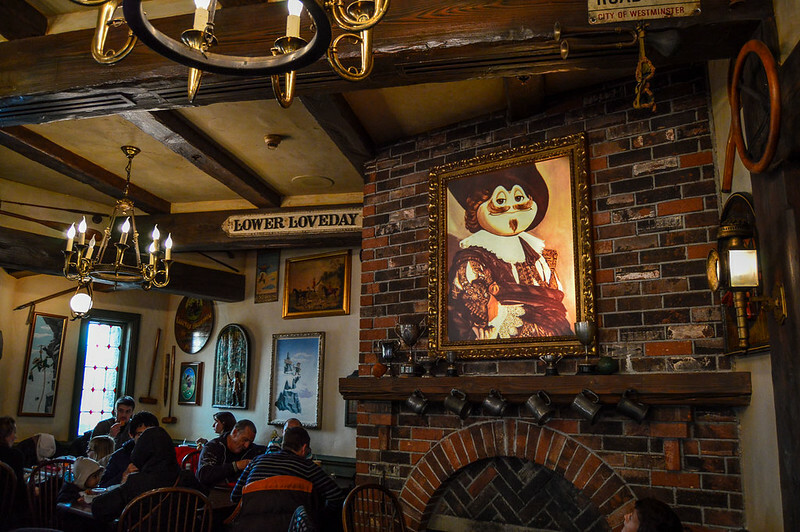 Located in the upper regions of Fantasyland, Toad Hall Restaurant is modeled on the stately ancestral home of Mr. Toad, which features prominently in the Disney animation The Adventures of Ichabod and Mr. Toad. If you’ve ever seen Mr. Toad’s Wild Ride in Disneyland you’ll probably recognize the façade. 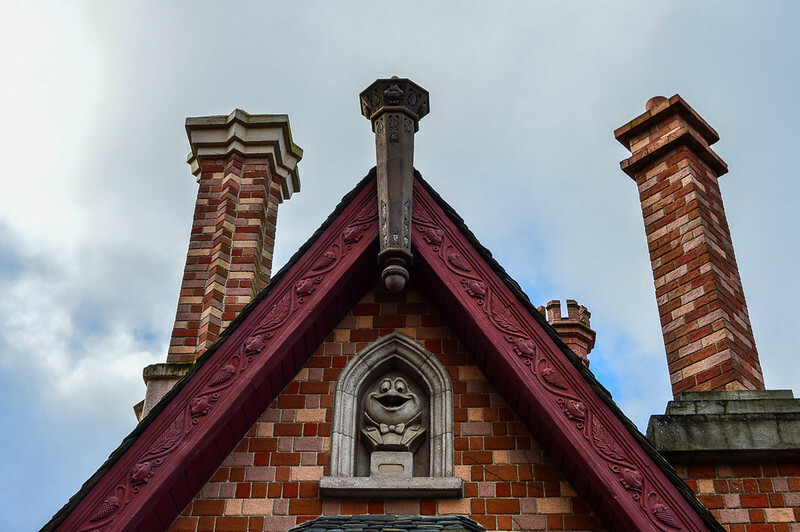 Built in the fashion of Tudor architecture, with its brick, multiple chimneys and family crest above the door, this mansion is a fitting residence for someone as grandiose as Toad. One look at this delightful building and we were hit with Toad mania. The interior décor is equally as delightful, reflecting the adventurous life of Mr. Toad and his ill-fated passion for motor cars. 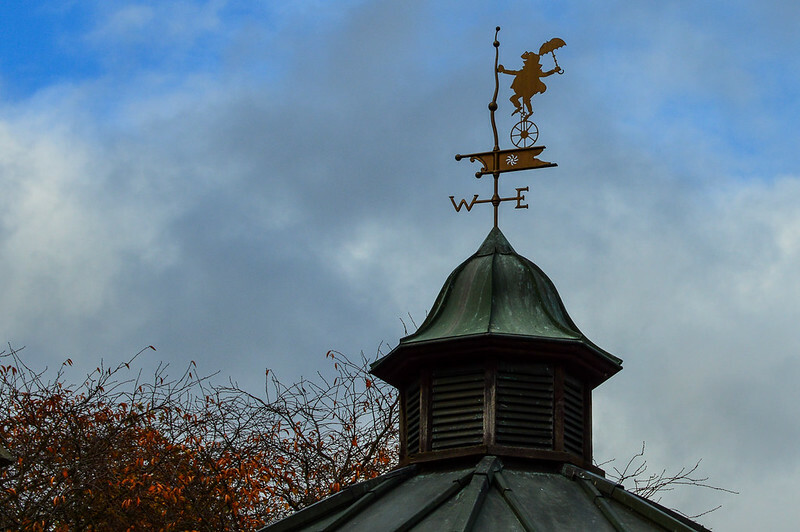 We thoroughly enjoyed seeing all the travel, change and excitement Mr. Toad has found around the world through the many paintings and collectibles throughout this estate. Also nice to see (in far less greater quantity) were the pictures of Mr. Toad’s friends, particularly Mole and Rat, who will forever be endeared to us as the charity cases from Disney’s A Christmas Carol. 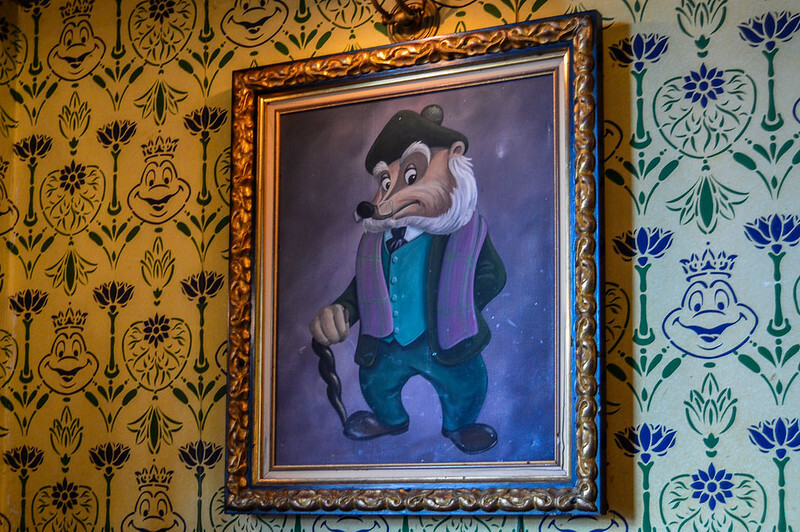 If there is one thing to be taken away from the wonderful décor of Toad Hall Restaurant, it is that Mr. Toad loves himself. And it’s contagious. Bouncing from room to room, losing ourselves in all the fun details and immersive theming (right down to the wallpaper), it’s hard not to love him too. 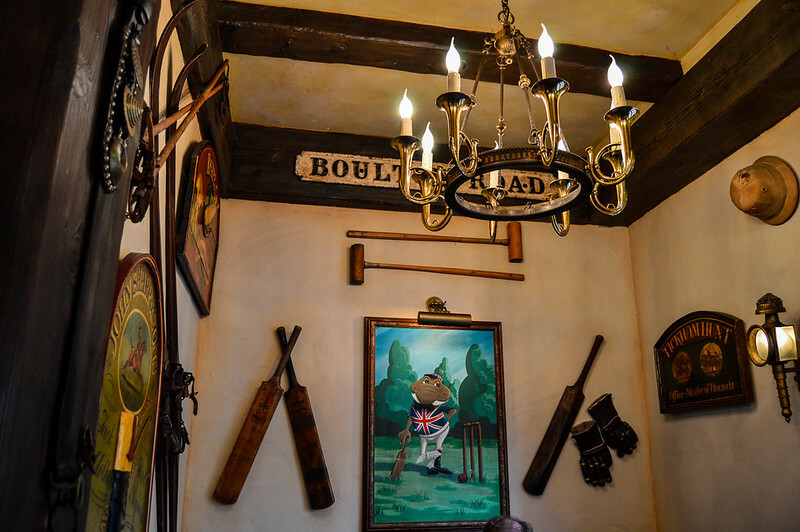 Toad Hall is a quick-service restaurant offering traditional English fare like chicken nuggets and brioche. The speciality of the house is the fish and chips. Everything else is your run of the mill offerings found throughout Disneyland Paris. We decided to get the double portion of fish and chips, which looked to be the best deal on the menu. It wasn’t the best fish and chips we’d ever had but it wasn’t bad and it is certainly one of the better things we’ve eaten inside the Disneyland Paris parks (though foodwise that might not be saying a lot). If I had to do it again, I would get the regular portion. 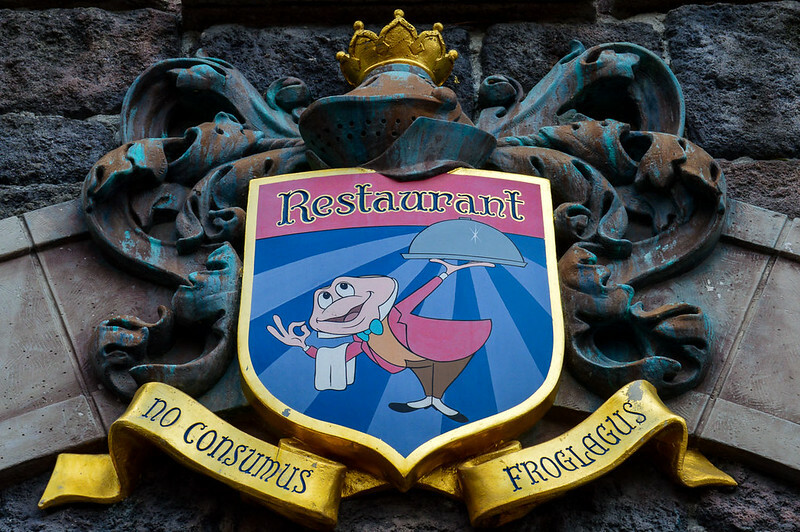 That said, I’m satisfied with my one time of experiencing the food at Toad Hall and in the future will probably just stop for a tour of the residence and go elsewhere for my meal. 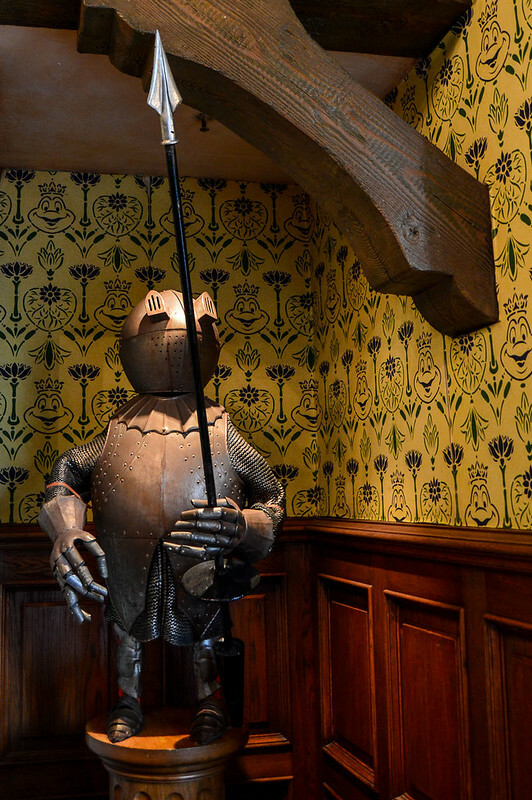 Although it is technically a restaurant, Toad Hall might as well be a walkthrough ride of the wonderful world of Mr. Toad. 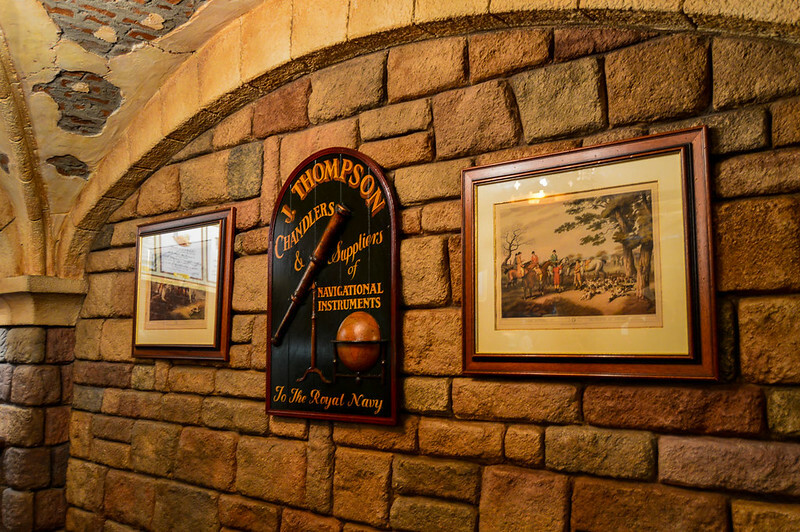 The food may not be spectacular, but the theming is, which makes it a must do for anyone looking for “so very british” cuisine on their next trip to Disneyland Paris. Many people (ahem, Tom Bricker) think Walt’s is the premiere themed restaurant at DLP, but Toad Hall Restaurant certainly gives it a run for its money. Furthermore, Walt simply created a multi-billion dollar company by turning a rabbit into a mouse, revolutionized the animation and theme park industries, and helped the dreams of countless people across the world come true. Toad, on the other hand, stole a car. I think the winner here is clear. Although admittedly I may have exaggerated the greatness of his character, nostalgic memories, peer pressure, and his presumedly enviable approach to life (most likely the result of his impressive portrait collection and this catchy number) are probably to blame, because from watching the above I was a little surprised to learn that Mr. Toad is kind of a jerk. But let’s weigh our judgement carefully. After all, he is one charming dude with a very nice house (that is occasionally open, though not as much as one would hope) and in the end, isn’t that what really matters?